Subaru is doing three things right to keep demand strong for the new 2014 Forester and 2013 Impreza. Why is Subaru succeeding when other smaller automakers have met their demise? Subaru just announced that strong demand for the new 2014 Forester and 2013 Impreza have increased their production levels year over year for the 4th straight month. And global production grew for the 4th month in a row posting the highest April production record ever. Recent reports from the Wall Street Journal say that Subaru supplies in the U.S. are so low the Japanese automaker will have to increase production to keep up with the strong demand for their vehicles. With the recent demise of automakers like Pontiac, Mercury, Hummer, Suzuki and Saab, what is Subaru doing so well that they keep growing? There are three key areas that keep consumers either coming back to the brand or is attracting new buyers who have never purchased a Subaru before. The success of the brand is not just luck, but is a carefully planned out strategy that buyers are responding to in a big way. If you live in the U.S. and have purchased a Subaru, you have probably done your research. But for those who are wondering if they should buy one, here are three key reasons why the brand is doing so well. Subaru is building some of the best designed and safest vehicles on the planet. They are the only automaker to have received the IIHS top safety picks for every vehicle in their lineup. The 2014 Subaru Forester was the only mid-size SUV out of 13 models to ace the new small overlap front crash test conducted by the IIHS. And the brand has just come out with their new EyeSight safety system that alerts the driver to possible crash situations. Subaru also builds a Boxer engine that sits low in the chassis that gives their vehicles better driving dynamics whether in their SUV’s or the new BRZ sports car. The engine also features the latest fuel-saving technology which makes the cars more fuel-efficient. Subaru also incorporates intrinsic value into their vehicles. They pay attention to details like how scenery reflects on the hood and how it affects stress on the driver. One thing Subaru has done well is to stay true to their core values over the years. At a time when many automakers are designing SUVs that look like sport coupes, Subaru bucks the trend and gives buyers what they want. Those core values include good visibility, cargo carrying ability and versatility. The secret to Subaru’s success is that they stick to the basics and then they keep improving on them every year. Another core value is staying with their excellent Symmetrical all-wheel-drive throughout their entire lineup with the exception of the BRZ sports car. Consumers have come to know Subaru as an expert in all-wheel-drive technology. 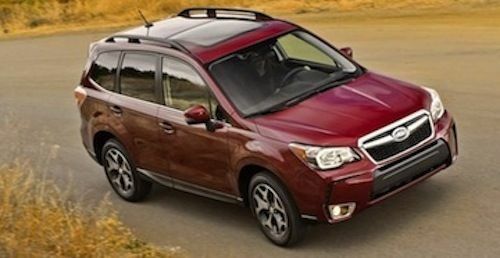 Consumer Reports gave the new 2014 Forester glowing reports. They said, “This new Forester embodies the saying “a steady pace wins the race.” The revamped 2014 model mid-size SUV won praise from the non-profit magazine for “space- efficient design, large windows, and big square doors.” Those and other features helped it outscore the new Ford Escape, Honda CR-V, Toyota RAV4 and Mazda’s CX-5. Subaru has done their homework and they know who their target audience is. You may not agree with Subaru’s philosophy, but when the automaker found that a high proportion of its cars were being purchased by lesbians in the Northeast, it embraced them and the LGBT community. The same holds true for outdoor enthusiasts in the Rocky Mountain and North Pacific Coast regions who are buying many of the Forester, Outback and new XV Crosstreks. Subaru spends generously to support causes and events that matter to its outdoor customers. Subaru also knows there is a big market with performance enthusiasts. The Subaru WRX and WRX STI are very popular with sports enthusiasts. Subaru has spent millions on its Subaru Tecnica International Inc (STI) race cars. Their operations in Mitaka, Tokyo, oversee the development of motorsport engines and chassis, development of Subaru STI versions and STI original limited edition cars. They also develop and manufacture competition sports parts, tuning parts and accessories for Subaru cars. Demand for the all-new 2014 Forester and 2013 Impreza is very strong and Subaru knows where their market niche is at. They are engineering quality automobiles and staying true to their core values. They have done a great job of marketing to their key customers and listen to what buyers want. It’s a formula for success that is paying off big for Subaru. Watch the Subaru 2014 Forester Takes on the Competition video.